The uplifting Rosewood essential oil is extracted from the heartwood of Rosewood tree through steam distillation. Light Miller in her book ‘Ayurveda and Aromatherapy’ says “Along with sandalwood, hina, myrrh and amber, rosewood is one of the five essential oils to put into your metaphysical first aid kit”. Rosewood also known as bois de rose is a mighty evergreen tree indigenous to Brazil and Peru. Aniba rosaeodora is a member of the Laurel family Lauraceae along with other aromatic trees like Camphor, Cassia, Bay and Cinnamon. Ayurveda, the mother of all healing systems have made significant use of this oil for opening the inner ear, rekindling spiritual feelings and for discharging offensive memories. The valuable wood of this tree was traditionally used in cabinet-making, carving, building, essential oil extraction and for making chopsticks. Certain texts state that the ancient French community used Rosewood for flooring, oils, furniture and guitars. The alluring fragrance of Rosewood essential oil made its demand sky-rocketing especially during the eighteenth century in the field of perfume-making. To mark its significance, Rosewood oil was a prominent ingredient of the well-liked perfume Chanel. No. 5. Industrial exploitation for numerous decades has led to categorize this tree as an endangered species and the legislation has now come up with a resolution that requires the essential oil distilleries to plant a new tree for every tree they use for essential oil extraction. Rosewood essential oil is regarded as a valuable oil mainly because of the rich presence of about 86% of linalool component, which can be modified into numerous derivatives of high value especially to the fragrance and flavoring industries. Other components of Rosewood oil are a-terpineol, a-pinene, neral, camphene, myrcene, geraniol, 1,8-cineole, geranial, benzaldehyde, limonene, and linalool oxides. These active components are responsible for the remedial properties of this oil such as aphrodisiac, anti-depressant, stimulant, anti-infectious, analgesic, antibacterial, tissue regenerator, deodorant, antiseptic, insecticide and cephalic. The essential oil of Rosewood is said to be stimulating and powerful in creating energy enrichment. Unlike other medical practices, Ayurveda considers every individual as a unique part of nature and treats every individual in a special manner as it trusts that each human being is made up of a specific set of energy elements known as doshas (vata, pitta and kapha). This noble science regards illness as an opportunity to help the body regain its rhythm with nature and in this process of restoring good health, Ayurveda recommends the use of herbs, essential oils, a balanced regimen, meditation, yoga and other physical exercises. Essential oil according to Ayurvedic texts is the aura or life force of plants, have been used in various Ayurvedic treatments like Abhyanga or Ayurvedic massage, aromatic therapy and in Panchakarma, the technique of Ayurvedic cleansing. Rosewood essential oil with its floral, warm, spicy, woody, fruity and enlivening aroma reduces excess of vata and pitta imbalances. Rosewood essential oil acts as a shield to your skin, defending against harmful bacteria, virus, fungi and other microbes. The natural antiseptic and antibacterial properties of this oil aid in treating wounds, cuts, burns and infections while preventing it from being septic. Excess of vata element in the body is characterized by wrinkling, dryness, thinness, flaking and dullness of skin. Rosewood is an effective vata reducing essential oil and gentle massaging of your skin with 5 to 6 drops of Rosewood essential oil with mild carrier oil like jojoba oil helps in dealing with such skin problems. Oily skin is the basis of numerous skin disorders like pimples, acne, blackheads, sensitivity and skin irritations. Massaging your facial skin with 3 drops of Rosewood essential oil blended with 3 drops of Lavender essential oil along with Almond oil can assist in decreasing pitta and pave way for a healthy and spotless skin. You can also add 2 drops of Rosewood oil in steam therapy for promoting blood circulation, comforting irritated and stressed out skin. The rejuvenating properties of this oil help in regenerating the skin cells and support the growth of new cells. Using it in your skin care lotion or cream will show visible results in reducing the symptoms of aging through tissue regeneration and absolute cleansing. Rosewood oil is an excellent pacifier that calms your mind and relaxes your senses. The anti-depressant, stimulating and uplifting properties of this oil instills confidence as it is known to bring fire and helps in regaining your energy naturally. Fearful, anxious, disheartened, nervous and hectic situations will take a back seat with the use of Rosewood essential oil in your burners, diffusers or vaporizers before going to bed or at the time of meditation. Miller’s Ayurveda and Aromatherapy book quotes Rosewood oil as “Rosewood helps to relieve tiredness, nervousness, stress, and it is very grounding, giving you a sense of protection”. Being celebrated for numerous years as one of the best essential oils for meditative and spiritual purposes, Rosewood oil grants a balancing and energizing effect on the mind while influencing constructive feelings even after a long, backbreaking day. Add 5 drops of Rosewood essential oil to your warm bath for easing tension, muscular pain, mood swings, pre-menstrual syndrome, nausea, headaches due to stress and general discomforts of the mind and body. Ayurveda manifests that there are seven vital centers of power in a human body known as Chakras, which affect the psychological and physical functions of the system. Among the seven Chakras, the heart chakra is responsible for love for others, creativity, compassion, love for self, emotions of sadness, loss and distress. The bracing aroma of Rosewood essential oil widens the heart chakra and assists in alleviating depressed feelings, egoism, negative memories and encourages one to spread love and compassion for others and self. Inhaling the aroma of this oil through diffusers or vaporizers or applying 1 to 2 drops on the chakra points will attend to your emotional needs tranquilly. 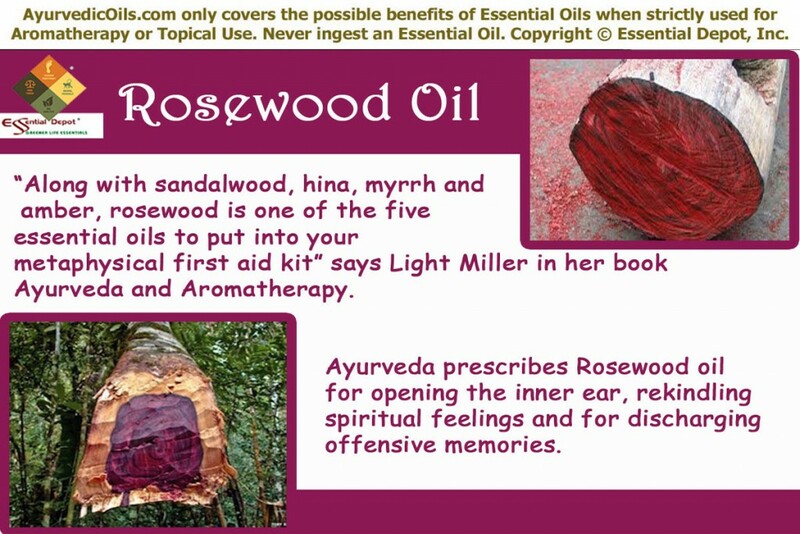 I am wondering whether Rosewood oil has aphrodisiac properties just because it has the romantic word ‘Rose’ in its name? Used in massaging, bath or vapor therapy, Rosewood essential oil has been in use for treating decrease in sexual interest, impotence, frigidity and loss of libido in both the sexes. The magical aroma of this oil strengthens the system, instills a sense of security and grants absolute relaxation for an idyllic mating. Rosewood essential oil, “Opens the inner ear and Compassion” according to Deborah Eidson, the author of the book Vibrational healing. It is known to enhance your divine feelings and help in spiritual realization. The other documented benefits of Rosewood essential oil are its use as an analgesic for treating cold, toothache and joint pain. It is also used as an effective insecticide to keep away from insects like ants, mosquitoes, fleas, bedbugs and lice. Disclaimer: Never use essential oils directly on your skin as pure essential oils are highly concentrated liquids and may cause harm. This article is for your information only. Consult your Ayurvedic Practitioner before using essential oils for your specific health conditions. 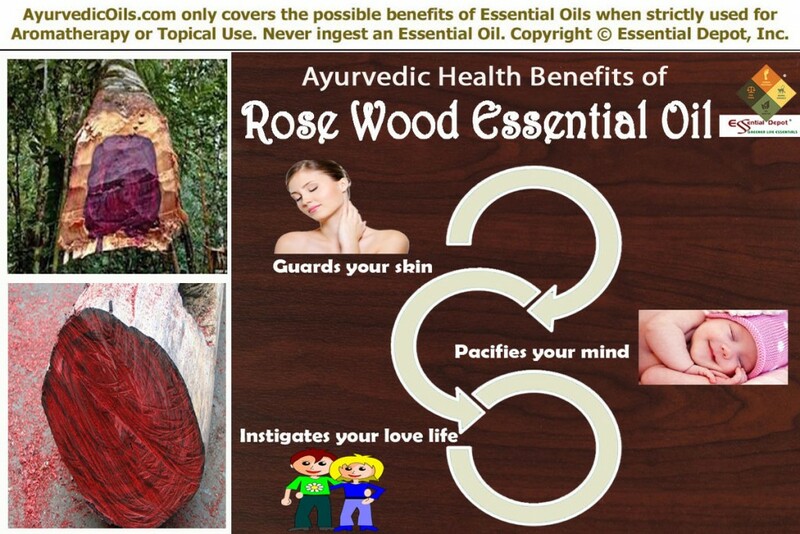 This entry was posted in Ayurvedic Essential Oils, Essential Oils - Learn About and Purchase and tagged Aniba rosaeodora, Ayurvedic Health Benefits of Rosewood Essential oil, Ayurvedic oils for depression, Chemical constituents of Rosewood oil, essential oils for skin care, Essential oils for stress, Health benefits of Rosewood essential oil, Natural aphrodisiac, Natural oils for aging, Natural remedies for wrinkles, Oils for acne, Rosewood essential oil, Rosewood in Ayurveda, Therapeutic properties of Rosewood oil by AyurvedicOils. Bookmark the permalink.